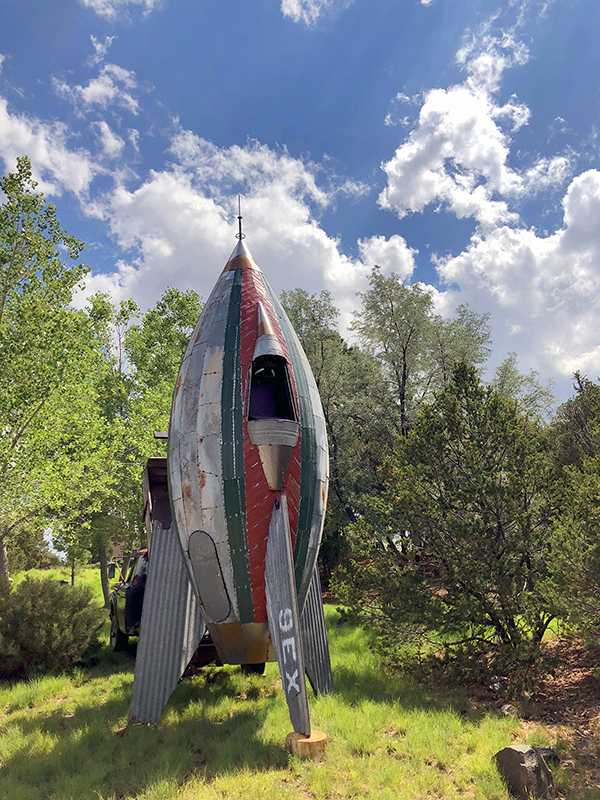 Visitors to SFI's Cowan campus are now greeted by an open-cockpit rocket mounted to a 1966 Ford pickup, created by cowboy artist Bob Davis. Imagine that you found Flash Gordon’s rocket in an arroyo and cleaned it up a little. I’ve wanted to build a rocket since . . . well, since forever. I built a hang glider and learned to fly it when I was 15 without ever having seen one in person. The incredible rush of foot-launching a hang glider made of surplus aluminum with black plastic duct-taped on is pretty close to what you might get from your own personal rocket. This project harkens back to the years immediately following World War II when just about everything seemed possible, children’s books were full of crazy crap like Mom and the kids running around on the Moon in space suits, and guys were building airplanes and gyrocopters from plans in the garage. Niner Echo X-ray is a Miller Omega Program artifact.